The Samsung Galaxy Note 3 Neo comes with an 8 MP camera sensor good for photos of up to 3264 x 2448 pixels in its native 4:3 aspect. The user interface is well familiar to all Samsung users at this point. A single viewfinder handles both still and video capture, so you don't have to switch modes. However, this is certainly not the most convenient solution as, if you're shooting full resolution 8MP photos, you'll have to frame your videos using a 4:3 viewfinder. The majority of the settings is located in the top left corner. Still, there a number of interesting options here like the setting for the volume rocker to act as a still shutter key, a video shutter key or a zoom lever. The HDR mode (Rich Tone) can be set to save a normal and an HDR photo or just the HDR one. Another interesting option is contextual file names - the Galaxy Note 3 Neo will name photos with your location (the GPS needs to be on for this to work). Anyway, the cooler settings are found in two places. The first is the Mode button under the shutter keys. It brings up a carousel with different shooting modes, each mode comes with a descriptive image and text. When you get familiar with those modes, you can switch to the grid, which drops he text but is faster. The other one is the arrow at the bottom of the screen, which brings up a row of color effects. Each effect gets a live preview, so you can see what the particular scene will look like with it. There's a download button so you can grab more effects. Some of the shooting modes we've seen on previous Samsung phones like Best Photo and Best Face, which snap multiple photos and let you pick the best one (in the case of Best Face, you can tweak each face in the photo individually). Beauty Shot does some automatic beauty touch up. Then we get into the more interesting shots. Eraser helps you remove moving objects (e.g. tourist waling into your shot). Drama mode takes a moving object and clones it several times. Note that the resolution for this mode drops to 1080p. Another way to capture moving objects is Cine Photo, which creates cinemagrams. The result is an animated GIF file. Sound & shot captures a photo and records ambient sound. It sounds pretty cool - for example, you can hear the sea gulls in a beach photo or the roaring of car engines if you're at a race - but we had problems sharing the shot. All the Galaxy Note 3 Neo would send is the still image, a JPEG, and the sound remains on the phone. Shame that Samsung didn't use the standard Audio note feature of JPEG photos for this one. One important shooting mode that's not found in the carousel is double shot. It snaps a photo with both the front and the back cameras, so the person holding the phone can be in the shot too. Now to the most important part - image quality. The samples have a lot of detail in them even in less than perfect weather, noise is kept well under control. White balance is pretty accurate and colors are pretty pleasing - striking good balance between natural and punchy. These are in fact some of the best 8MP snaps we've taken in a while. HDR stills come out great as well. The Samsung Galaxy Note 3 Neo does well to develop the highlights that would otherwise be clipped, while shadows are only improved slightly, so contrast is still great and images don't look too flat or unrealistic. HDR images have an excellent amount of fine detail, too. Panoramas on the Samsung Galaxy Note 3 Neo can go as high as around 10 MP but only if you shoot in portrait mode as the images come out just over 1200 pixel tall, while in landscape panorama shooting you're getting an average of around 600 pixel height, which isn't ideal. In either mode you can shoot images around 8000 pixel wide. The stitching is seamless and the software uses the gyroscope and accelerometer to guide you and warn you if you're going too fast or moving off the right line. The Samsung Galaxy Note 3 Neo is more than capable of carrying its own weight in our Photo Comparison tool. You can see it does pretty well against the other top notch 8MP snappers and even trades punches with some of the 13MP cameras out there. The detail levels in the videos are very high, while colors are pretty good and the framerate very consistent. Contrast and white balance are great too for some impressive footage overall. It's not quite as great as the 4K produced by the Note 3, but the Neo does pretty well in its own league. Here is a 1080p video we've uploaded on YouTube. And here's an untouched 1080p @ 30fps (10 seconds, 22MB) video sample taken straight off the Galaxy Note 3 Neo. 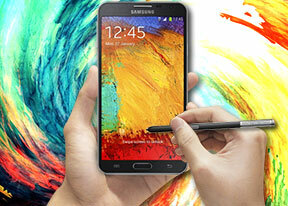 The Samsung Galaxy Note 3 Neo enters our video comparison too. There are plenty of 1080p camcorders you can compare it, but it has proven to be among the best with great detail, colors, contrast and white balance.